Tearooms come in all shapes and sizes. When we think of a tearoom, we often picture an elegant Victorian setting with silver, three-tiered trays loaded with cucumber sandwiches, scones & petite fours and lovely ladies wearing red hats and dressed in their Sunday finest. Up till now, those are the tea shoppes we have visited and blogged about for this segment of LanceAroundOrlando.com. 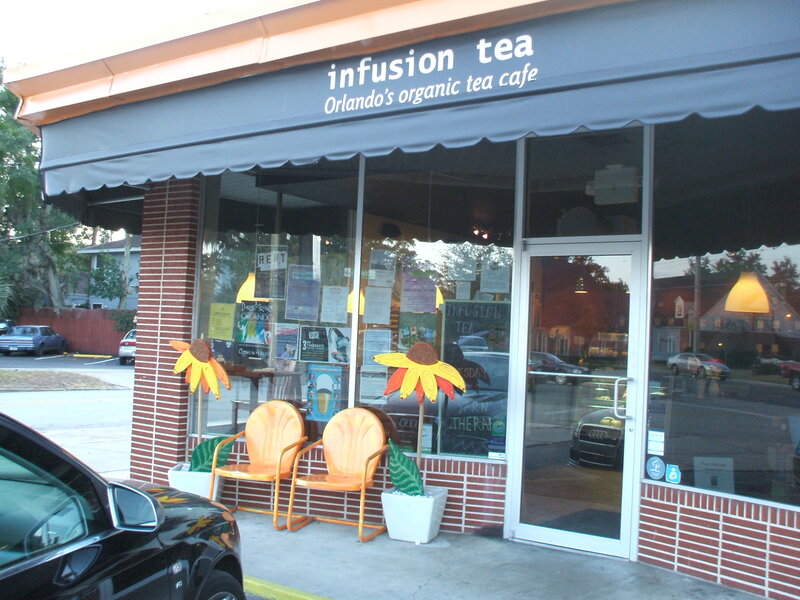 To conclude this series on tearooms near Disney World, Mrs. LanceAround, Number One Daughter and I travelled to downtown Orlando, just 15 minutes north of Disney, and paid a visit to Infusion Tea. 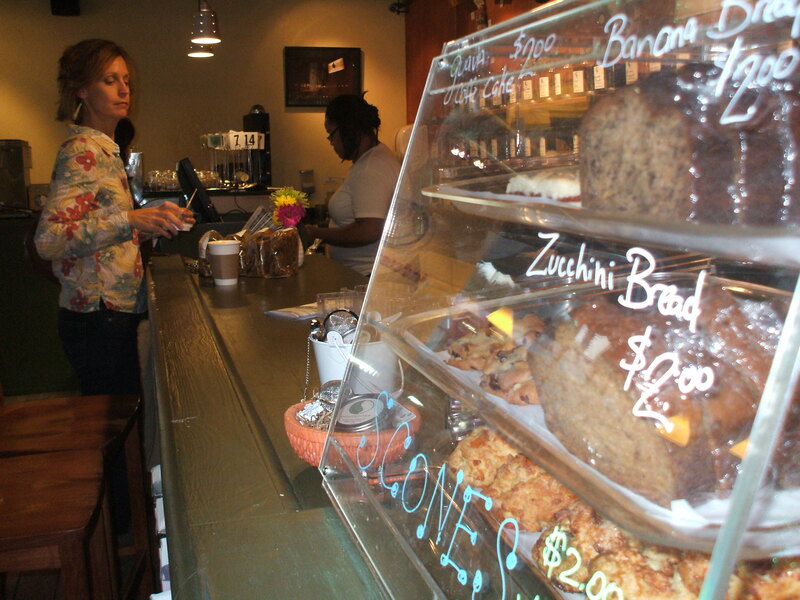 Teamap.com lists Infusion as an “Urban” tearoom, “A modern tea house and organic/vegetarian cafe.” It ranks 19th out of 117 tearooms in Florida. That ranking is completely wrong–Infusion is in a class all by itself! Upon entering Infusion, the modern, lime green plastic chairs and the co-op artisan gift shop instantly communicate that you aren’t in Grandma’s Tea Room anymore! 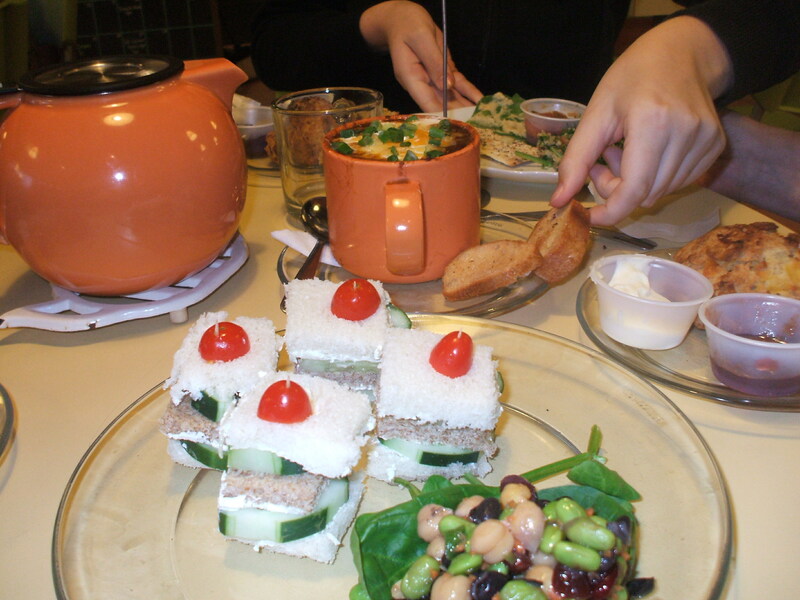 We decided to make a meal of it and ordered the tempeh chili, three-dip flat bread platter, today’s special potato crepes, a piece of red velvet cake and the more traditional cucumber sandwich and scones with clotted cream to round out our tea tasting. Unlike fancy tearooms, at Infusion you place your order at the counter before finding an empty table. The waitress was knowledgable and thorough, but she never smiled and didn’t seem particularly glad to have a customer. [1/23/10 Editor’s Note: This morning, another server at Infusion informed us that 0ur waitress is from Haiti and has loved ones there. They are okay, but this could explain why she was not smiling during our visit. Our thoughts go out to her and her loved ones!] Soon after ordering, we were served our scones and it was obvious that the clotted cream had been placed in its little plastic container at the start of the business day and left to coagulate in the refrigerator ever since. I was prepared to be very disappointed. First up was the three-dip flat bread. A dollop of freshly made hummus beside a scoop of chutney and then a smattering of tabouleh served with slices of crisp, flat bread. All of it was delicious. Then came the cucumber sandwich. Traditional cucumber sandwiches are made with paper thin, near transparent slices of cucumber. Infusion appeared to take pride in cucumber slices that were almost too thick to bite. My disappointment gave way to wonder as I noticed the three-bean edamame, chick pea and black bean salad beside the sandwich. Both were quite tasty. Then came the tempeh chili topped with sour cream and cheese and the potato crepe also topped with sour cream. The crepe needed some salt, which was easily provided. The chili was a perfect refuge from an unusually chilly Florida evening. Oh…yeah…and we had some tea. Number one daughter selected Monk’s Tea. Turns out it was referring more to a Monastic Order than her favorite TV show that stars Tony Shaloub, but we all agreed the tea was supreme-o! 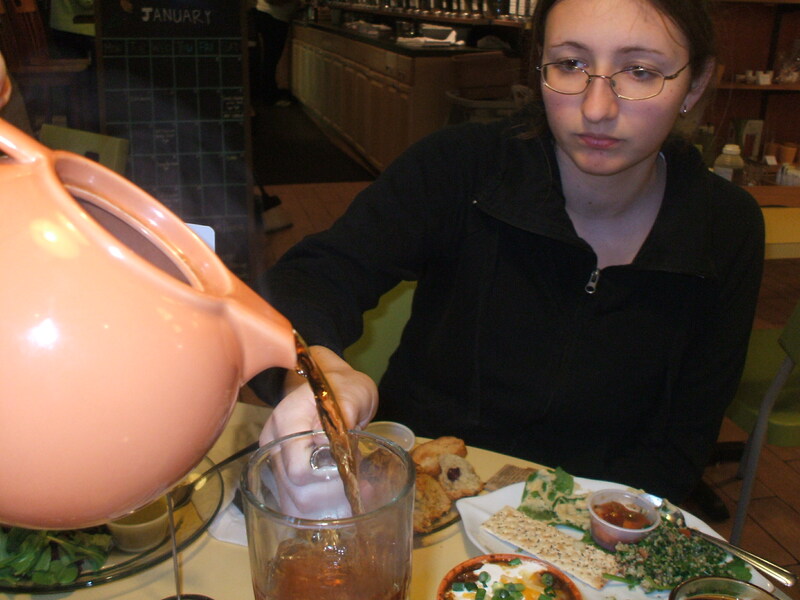 While Mrs. LanceAround and I thought the tearoom fare was way above average, Number One Daughter was less enthusiastic. As she put it, the tearoom was passable, but the artisan gift shop made the trip worthwhile. 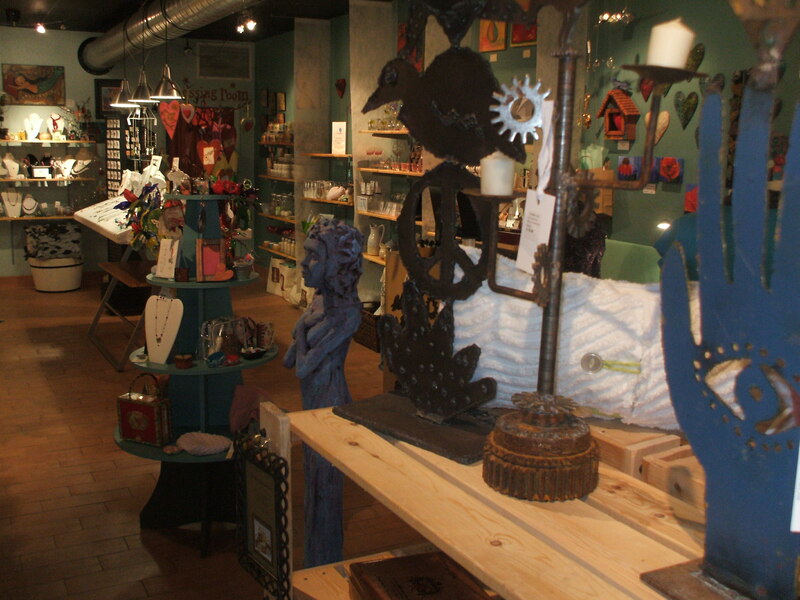 Local artists share in the rent, display and staffing of the gift shop which occupies half of the space within Infusion Tea. Number One Daughter would squeal with delight as she encountered one creative piece after another. They say a picture is worth a thousand words, so I put a lot of photos into this post. Unfortunately, upon review, I notice that they lack the scent and the taste that made up the best part of Infusion tea. We can go grab that taste whenever we want. The fine readers of my blog, however, will have to wait until they travel to Orlando. Fortunately for them, they will have read this post and will know where to go for a delicious and memorable tea time. In the meantime, pass the clotted cream, would you honey? This entry was posted on January 19, 2010 at 1:30 pm and is filed under Restaurants. You can follow any responses to this entry through the RSS 2.0 feed. You can leave a response, or trackback from your own site. Lance ~ I’ll be wanting to know YOUR #1 tea room – maybe we can visit in May. I have several friends I’m hoping to meet up with on our next trip and think how neat it would be to do so over tea. 🙂 This has been a very fun series. Hi Heidi: It’s hard to pick a # 1 because they are all so unique. If I’m in a hurry, I will go to Wishes Brew because it’s the closest. (But it was certainly my least favorite.) If I don’t have a lot of time, but want a quality “Tea Time” experience I will go to Hart Sisters (which is closer than Tea Cup). If I want a more “British” experience, I will go to Windsor Rose Tea Room in Mt. Dora (which I did not review.) If I am more hungry and looking for a full meal I will go to Infusion. If I have a lot of time and want a classic “High Tea” I will drive to Tea Cup in Brandon (about an hour away.) 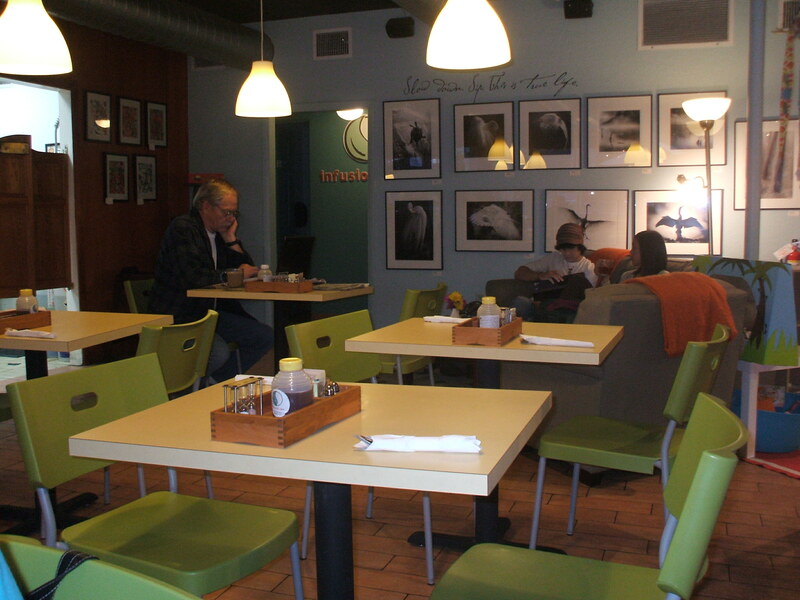 If I’m curious about what is happening in the local community I will go to CommuniTea in downtown Orlando (I did not review that one, either.) I also haven’t had a chance to try Ye Olde English Tea Room in Lake Mary or Victorian Grace in Brandon. But if you pin me down and insist that I name a favorite…Well…I will name two that are fantastic…That would be Cup of Tea for a classic, romantic or relaxing afternoon or high tea and Infusion for a “take a break and enjoy the food” modern tea experience. Thanks for the compliment and when you visit in May I’d be delighted to allow you to treat me to a tea…er, um…would be delighted to go to tea with you!